与往年的颁奖典礼一样，除常规的颁奖环节外，CPAC基金会特意安排了获奖者分享成功经验，从学习习惯、学习方法、家庭教育、社会活动等各方面与同龄人及家长分享心得体会。今年，基金会还特别邀请了两位主题演讲嘉宾：一位是培育了两名学霸的Helen Cao女士，分享她的育儿经。曹女士的儿子现在麻省理工学院(MIT)博士在读，是获GPA满分4.0，并被学校破格升级为5.0以示嘉奖的超级学霸，在被麻省理工学院提供全额奖学金录取之前，还同时收到了哈佛大学、斯坦福大学及剑桥大学全额奖学金入学通知书；女儿则是Dalhousie 大学法学院在读，LSAT入学考试获99%高分、同时是魔方世界女子第一6年记录保持者。相信学霸父母及品学兼优的获奖学子们的分享一定能给更多莘莘学子和家长以鼓励和启示。另一位是曾在多家知名企业任高管职位的Marilyn Flanagan，她将为大家分享企业对现代人才的要求以及教育在塑造我们价值观念中的重要性。Ms. Flanagan曾任：the past President of Textualis, one of Canada’s premier translation services organizations specializing in multi-lingual communication processes; the Senior Vice President of Business Operations at IFDS, the leading supplier of investor record keeping services for the Canadian and European mutual funds market; the Chair of the Canadian operating committee and a member of the global quality review team; the Senior Vice President of National Sales and Service for TD Meloche Monnex and led a group of close to two thousand insurance professional from coast to coast, and she was with Meloche Monnex for more than twenty years and as a member of the senior management partnership team. 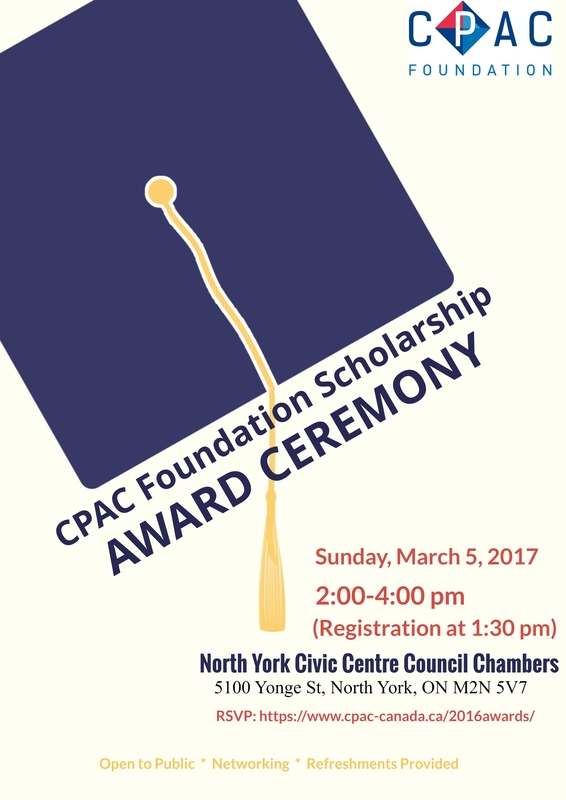 February 17, 2017, Toronto, ON – The CPAC Foundation announced this year’s ten recipients of the CPAC Foundation Scholarships and Awards. There are six awards, one sponsored by Queen Financial Group, given to high school students with a combination of strong grades and dedicated volunteerism. Each award is worth $1000. The recipients include Aiken Chau from Mary Ward Catholic Secondary School, Co-President of his school’s DECA Chapter; Elaine Ke-Xin Liu at Don Mills Collegiate Institute, who works as a youth leader with St. John Ambulance; Emily Cross from Hammarskjold High School, the Regional Director of Sustainable Youth Canada’s Thunder Bay chapter; Kevin Zhang from Victoria Park Collegiate Institute, who worked with the Alzheimer Society of Toronto; Mokai Xu from Bayview Secondary School, one of 2016 Ontario Top Scholars and Director of Women in Computer Science Waterloo; and SongLing Wang from The Woodlands School, who is a Junior Executive on The Prefects. The CPAC-TD Insurance Meloche Monnex Scholarship, worth $3000, is given to an accomplished post-secondary student with demonstrated leadership. Sari Ohsada, an Environmental Science and Global Development Studies student at Queen’s University, is given this honour for her work in social justice and climate change education. The CPAC Special Scholarship, worth $3000, is given to a student that played an active and leading role in a meaningful project to the community. The recipient, Yiqiao Chen of Leaside High School, is awarded for her work in running Vision Exchange, a program matching blind Chinese individuals with English-speaking mentors. The recipient of the CPAC-Tianbao Education Scholarship is past award winner, Echo Wu, studying Accounting at Seneca College. Receiving the CPAC-Investors Group Education Scholarship is Shi Ting Lu, studying Engineering at the University of Toronto. Both scholarships are given to students in strong academic standing with financial need, and are worth $3000 each. The total value of scholarships and awards given out this year is $18,000. An award ceremony celebrating the achievements of these young individuals will be held on Sunday, March 5, 2017 at the North York Civic Centre’s Council Chamber and is open to the public. The ten scholarship and award recipients will share their inspiring stories based on their accomplishments. “It’s a great opportunity for students and parents to share their experiences and learn from one another,” says Andi Shi, Executive Director of the Foundation. In addition to the award recipients sharing their stories, the CPAC Foundation Scholarship and Award Ceremony will feature two keynote speeches. Ms Helen Cao will share her experiences as a parent to two accomplished children, one of whom chose to pursue a PHD at Massachusetts Institute of Technology (MIT) over offers from other schools including Stanford, Harvard and Cambridge and the other a six- year record holding World Cube Competition Women Champion studying at the Dalhousie University Schulich School of Law. Audiences will learn about her role in fostering her children’s success with personal accounts of the relationship she shares with them. Another keynote speech entitled “Educate, Appreciate, Dominate” will be presented by Ms Marilyn Flanagan. Ms Flanagan will speak on the importance of education in shaping our values, the role that scholarships play in supporting that education, and, the resultant opportunities. Ms Flanagan’s career comprises many executive roles including the Past President of Textualis, Senior Vice President of Business Operations at IFDS, Senior Vice President of National Sales and Service for TD Meloche Monnex, and guest lecturer at McGill University Faculty of Management. Audience will surely benefit from her vast management experience and advanced leadership skills. The CPAC Foundation is founded in 1999 and is a registered charity that raises funds in support of CPAC’s work within the immigrant community. The CPAC Foundation also has its own education related initiatives. The Foundation continues to support CPAC in carrying out its mission of helping internationally trained professionals and tradespeople to obtain licenses, find jobs, advance their careers, develop leadership skills, and integrate into Canadian society. For its own initiatives, the Foundation organizes activities that provide educational information to parents and students. It also provides scholarships and bursaries to secondary and post-secondary students who have demonstrated social responsibility and a determination to pursue academic excellence. Since 2000, the CPAC Foundation has given out more than 200 scholarships and bursaries with a total value of $246,000. It has also built two schools in poverty and disaster stricken areas in China.